So I'm wanting to do the 120km 2009 Coast to Coast in March and I'm a bit worried. So far, I'm not really doing anything too tricky. For instance, I just did a quickish ride - about 2-2.5 hours worth of effort there. At least when I took the short cut option home I got splattered with every insect known to man, and managed to see lightning as few have ever seen it - from right above Adelaide. Update: How neat is this! 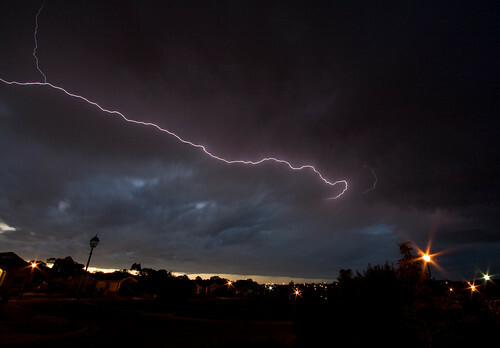 A photo of one of the huger lightning strikes! This is the biggest one I saw, I'm pretty sure. Two weeks ago, I did from my house to Mt Barker - about 4 hours in total one way (55km) with two generous rest breaks, then I kind of puttered along for a while. I got a lift from Hahndorf back to Crafers, cutting out 12-20 km of uphill on the return journey. Total distance 89.8km - 12km of car ride. Now I'm looking at this and thinking... whoa - 120km? Am I going to die doing it? My next plans are to repeat the Mt Barker ride, but this time make it back. The frustrating part of this all is that I can't seem to find anyone to partner up with - I tried getting a friend interested in getting fit for when he joins the police, but there was no chance. The only other people available are going to be Bicycle SA people; who will be fitter than me; or other people who are super super fit. I either go too fast for my friends, or I drag down people who actually ride more than once in a blue moon. Even worse, I'm thinking about buying knicks.